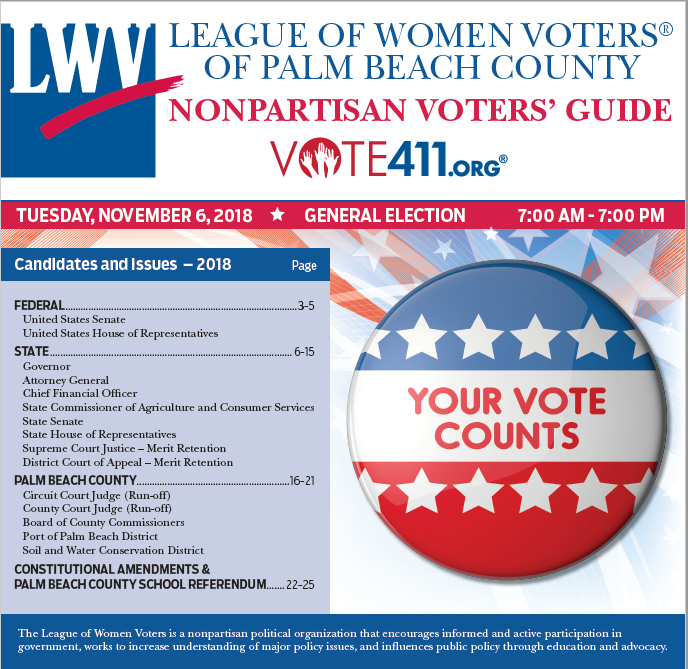 PALM BEACH COUNTY'S VOTERS GUIDE IS HERE! To see the full PBCLWV Voters Guide, please click the button below. 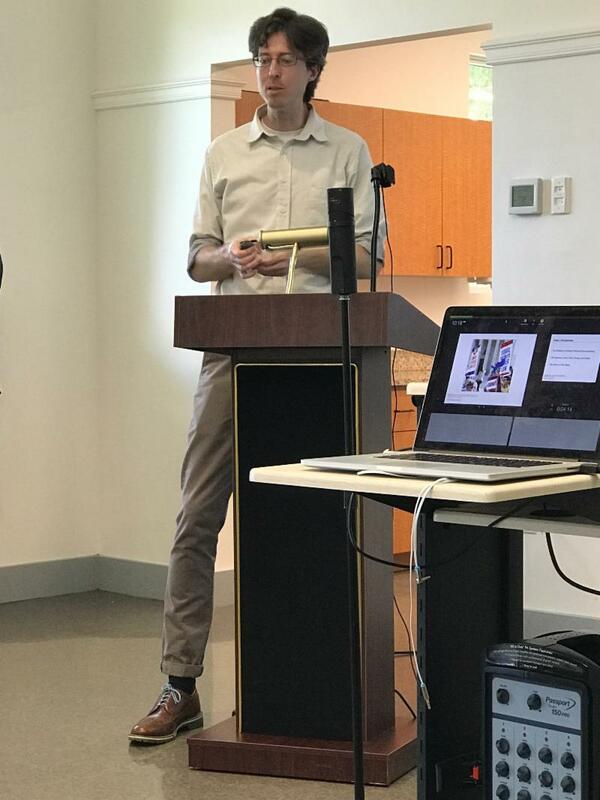 Tom Wolf, of the Brennan Center for Justice, gave a wonderful program on Gerrymandering & the Court at our Cool Topic on Saturday, September 8. Tom explained partisan gerrymandering so we could all understand it. He talked about federal court decisions and recent SCOTUS (Supreme Court of the United States) developments, and why gerrymandering is important to Florida: LWV led the passage of Fair Districts legislation, then sued and won redistricting, but we still have vestiges of gerrymandering, and bad court decisions could seriously imperil our voting rights. Tom engaged the audience and got excellent questions. This program was presented as part of a grant from Progress Florida Education Institute to educate the public on Why Courts Matter: the importance of good judges and good federal court decisions in daily life . To view the presentation, click the "View Presentation" button below. To see upcoming "Why Courts Matter" events, click the "Why Courts Matter" button. Miami-Dade County will host the 10th Annual Southeast Florida Regional Climate Leadership Summit on October 24-25, 2018, at the Miami Beach Convention Center. Join us in celebrating a decade of progress with critical discussions on adaptation, innovation, and resilience. The Summit will feature keynotes and panels with local, state, and federal government officials, business and nonprofit leaders, and other experts discussing plans to ensure the region not only survives, but thrives, in the face of sea level rise and other climate impacts. View the draft agenda b y clicking the button below. . 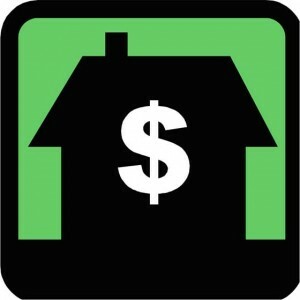 This annual event is coordinated by the Southeast Florida Regional Climate Change Compact, a partnership between Broward, Miami-Dade, Monroe, and Palm Beach counties; their municipalities; and other partners. The Climate Leadership Summit is a major regional event focused on facilitating climate-related collaboration and knowledge sharing. The Summit attracts innovative thinkers and leaders from business, government, academia, and the nonprofit community to exchange ideas and dialogue through panel discussions and networking breaks. Register below ! 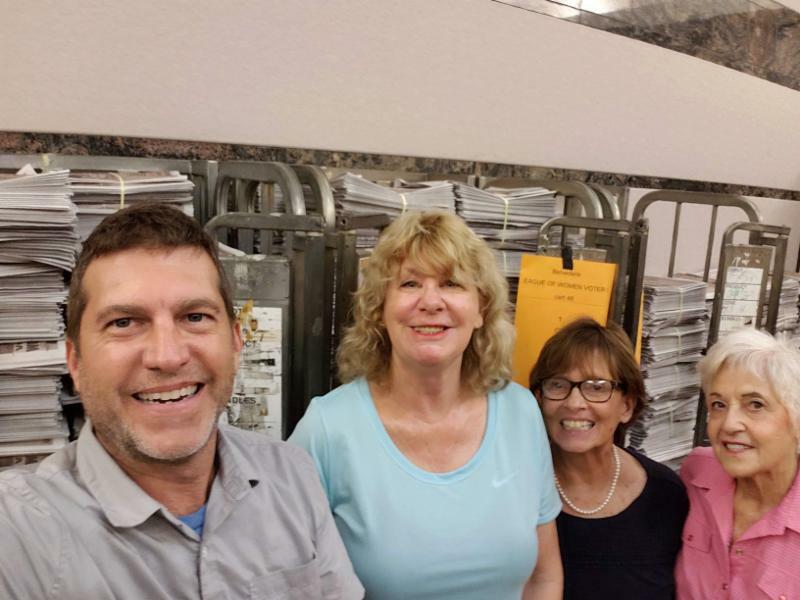 Our hardworking volunteers spent untold hours bundling and delivering thousands of copies of the Voters Guide to locations throughout Palm Beach County this past month. Each volunteer who helped create, edit, publish, and distribute deserves a huge thank you. The Guide is one of the premier publications of the League of Women Voters. This years' edition ran 28 pages because of the number of candidates and ballot questions. It was an awesome task that was handled extraordinarily well. Energized by the National Popular Vote’s giant win at the June LWVUS national convention in Chicago, Florida NPV (National Popular Vote) leaders are reaching out to chapters across the state to help make NPV the law of the land so every vote counts in presidential elections. In August and September LWVPBC member and NPV state Chair Kathleen Crampton and her team are holding bi-weekly interactive ZOOM webinar training sessions with members in more than a dozen Florida leagues to present the core issues supporting the National Popular Vote movement. 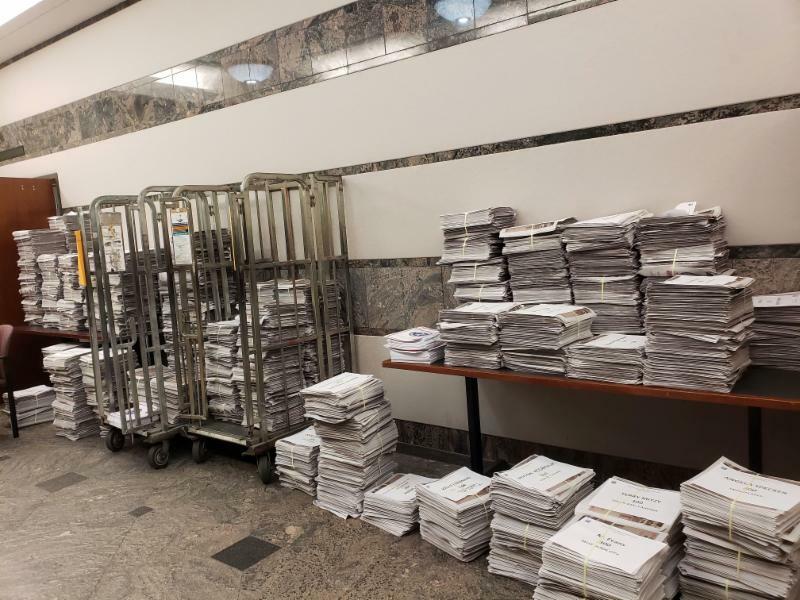 This includes access to documents including PowerPoint presentations, frequently asked questions, and sample letters to the editor to educate members, the media, lawmakers and voters. While it can be a complex topic, the issue boils down to this: it is time to recognize that most Americans want the President of the United States to be the candidate who wins the most popular votes, and the constitutional way to do that is by states passing laws to join the National Popular Vote Interstate Compact. 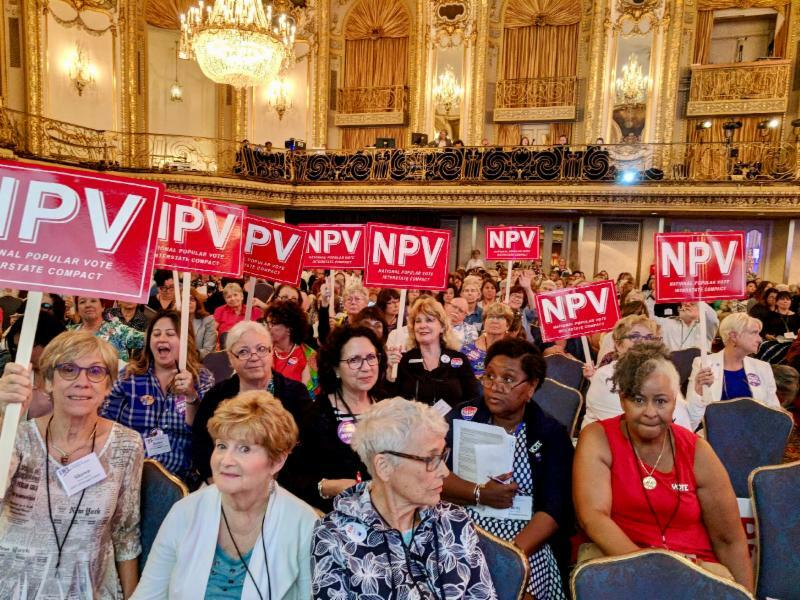 Only four months ago, NPV became a national priority at the June LWVUS national convention where Crampton, supported by a record level of Florida members, was able to win NPV a place on the league’s national agenda as a key plank in LWV’s Making Democracy Work program. Now Crampton and her team are using that momentum to push full steam ahead with the goal of getting NPV passed by the 2020 Presidential Election. In two of the five past presidential elections the candidate who won the most popular votes lost the election, including President Donald Trump who says, “I would rather have a popular election” (Fox 4/26/2018). 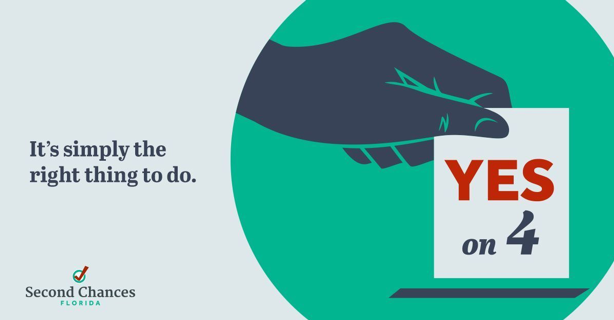 In fact, NPV is supported by members of both parties and is gaining momentum especially since Connecticut passed the National Popular Vote Interstate Compact (NPVIC) in May and more states are considering to follow suit. So far, 11 states and the District of Columbia have passed NPVIC laws accounting for 172 of the 270 votes needed to activate the compact. The purpose is to align the electoral system with the will of the American people for the first time in our nation’s history. Pictured above is the Florida delegation at the LWV National convention. 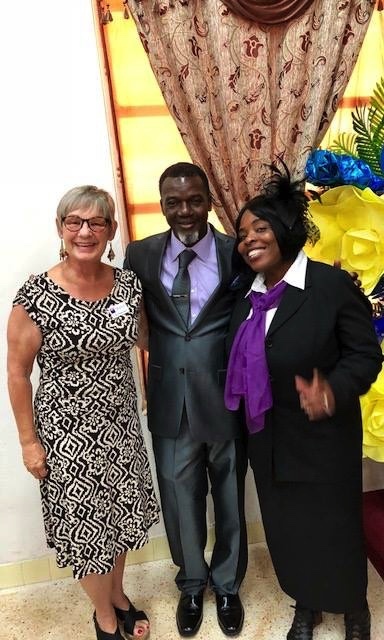 Pam Maldonado with Pastor Gary Guerrier and his wife, Nelly, at the First Baptist Church, a Haitian congregation in Delray Beach. Pam was invited to speak during Sunday services about the importance of voting. The League will be doing a voter registration and education in a few days. The League is actively reaching out to the Haitian community. Stay tuned. 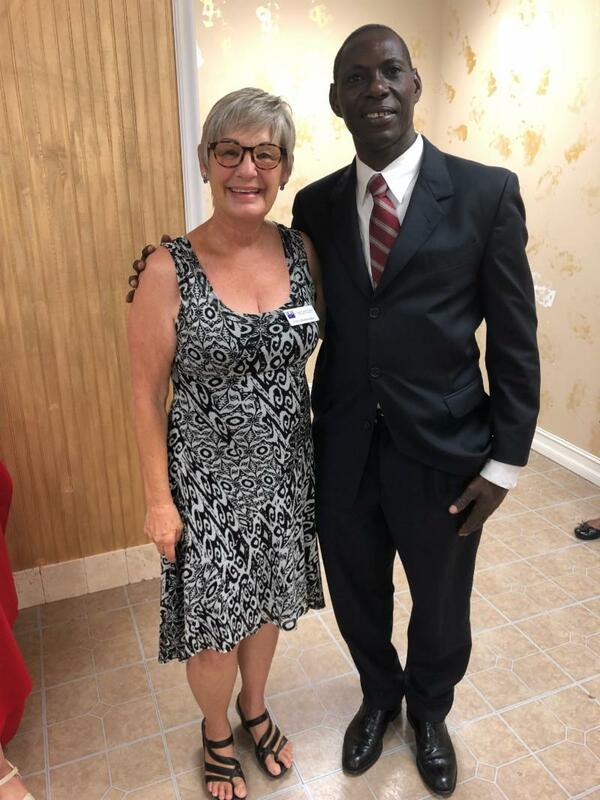 Pam Maldonado with Pastor Villefranche Jerome of L'Eglise Sur Le Rocher, Sunday, Aug. 26th. Parking pass required for Osher Lifelong Learning Programs in Boca Raton and Jupiter.